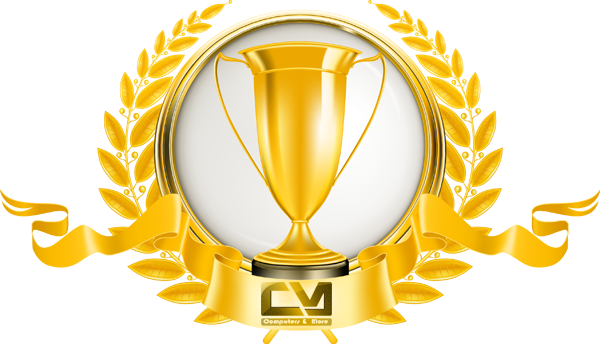 Adata did turn a lot of eyeballs this year at COMPUTEX 2016 when they launched a range of new products ranging from NVMe SSDs to Memory Modules. Out of the lot one thing caught everyone's eyes and attention & that was their succession to the XPG series in form of the Adata XPG Dazzle DDR4 Memory Kits that came with a bling, literally! Before I move forward I'd really like to thank the guys at Adata India to be generous enough for lending me a sample for review today. Coming in three frequencies ranges of 2400Mhz, 2800Mhz and 3000Mhz these kits come equipped with red LEDs on top of the headspreaders to impart a fresh and distinctive look. These are available only in DDR4 standards & are compatible with both, the dual-channel and quad-channel configurations. 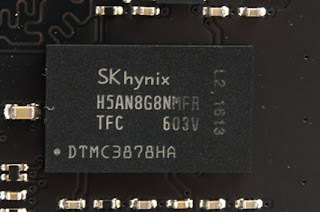 We have with us the 16GB kit of 2400Mhz today so let's dig in deep to find out more. Some more details are revealed here where we can see that its a post production sample and no pre production gimmick is done here. Also the DRAM manufacturer is SKHynix and no thermal sensor is present on this memory kit. 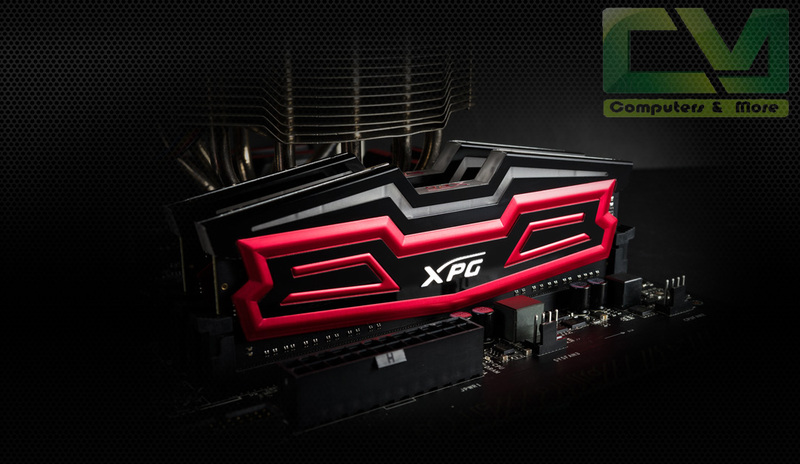 Moving on from what we are used to from Adata packing style, the XPG Dazzle comes in a solid cardboard box containing the RAM sticks inside a blister back. The front has every details enlisted and printed nicely including the capacity, number of sticks, frequency and also the 10 layer PCH feature and even a rendered image of the memory with a cut out at bottom to look at the actual memory stick resting inside! The back is blank with just a QR code for easy product registration and free software download. Inside the clamp shell packing holds the two RAM sticks nice and tight. The clamp shell has space for four sticks so I presume that Adata is keeping the packing style generic for all the XPG Dazzle memory kits. Looking at the actual memory sticks I'm really impressed by what the product looks and feels like in reality! Its a black and red kit with a sharply designed heat-sink that gives it a catchy look even with the LED turned off. The back is identical to that of the front with a sticker enlisting all the technical specifications. Model number, rated frequency and voltage along with other details can be found on the sticker quite easily for personal reference. Top end has the clear fiber glass strip covering the LEDs beneath it. A subtle touch is provided by the crisp XPG logo printed on top of this strip placed right in the middle. An all black PCB is there so this kit can go with almost all the builds of today since black is the predominant color for DIMM slots on motherboard from leading manufacturers. Measuring in at 4.73cm in height they'll not be an issue of compatibility even with the beefiest of air coolers out there which is a great thing as again many new air coolers along with hybrid AIOs have started making their appearances in the market! The PCB is what Adata calls a 10 layer PCB with Thermal Conductive Technology, improving cooling performance for stable operation & to improve the quality of signal transfer and maintaining great stability even if the system operates in high speeds or is taking on heavy multitasking. Installing and booting up into Windows was easy with the Adata XPG Dazzle DDR4, the LEDs even lit up red from the get go itself which follow a breathing mode like pattern maintaining a perfect sync with each other. I wish it was possible to have some control over the pattern of their blinking but sadly that's not possible! By default the memory kit works at the default 2100Mhz but upon enabling the XMP 2.0 profile we hit a perfect 2400Mhz at 16-16-16-39-2T with 1.2v which is in match with the rated speed and timings. The system was perfectly stable and booted up properly with no hiccups whatsoever completing all the benchmarks flawlessly. For overclocking I started with higher frequency approach and attained a stable 3000Mhz with 16-18-18-50-2T at 1.35v and just to keep you informed this is the exact timing and rating of the Adata XPG Dazzle 3000Mhz DDR4 Kit which is obviously more pricier than this one! So interestingly this adds a ton of value to this particular memory kit! Now you know me quite well I don't go easy on overclocking so we took a step forward and managed the same 3000Mhz at a tighter 15-18-18-50-2T at 1.45v anything more than that either in terms of higher frequency or tighter timings gave us system freeze of boot failures so this was the max I could push this kit. 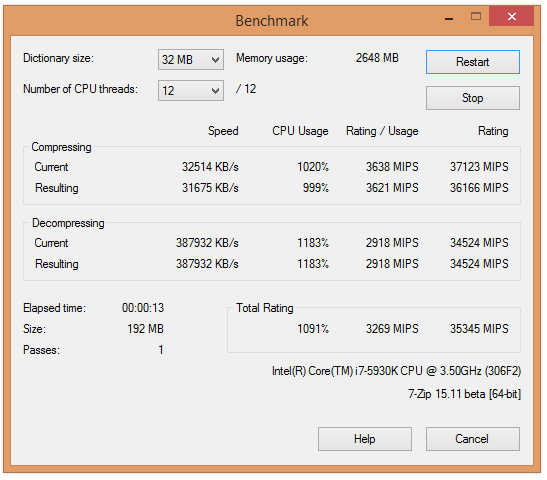 Not bad I'd say for a 2400Mhz rated kit. For the benchmarks now I'll be using the rated 2400Mhz CL16 and 3000Mhz CL15 as that'll be what you get out of the box against the best this memory is capable of! 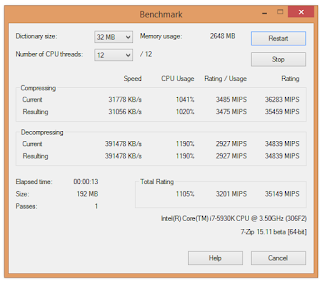 AIDA64 implements a set of 64-bit benchmarks to measure how fast the computer performs various data processing tasks and mathematical calculations. 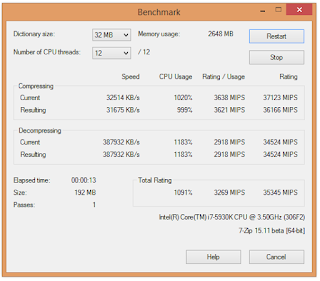 Memory and cache benchmarks are available to analyze system RAM bandwidth and latency. This suite allows you to measure the performance of your computer. 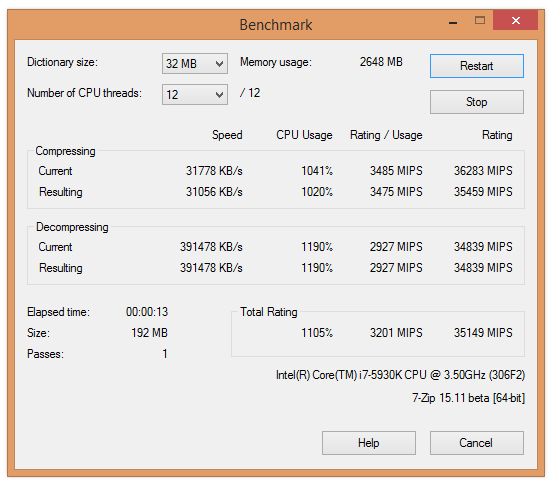 The benchmark shows a rating in MIPS (million instructions per second). There are two tests, compression with LZMA method and decompression with LZMA method. Once the total passes reaches 100, the score is taken. Higher the score better is the computer's overall performance. wPrime is a leading multithreaded benchmark for x86 processors that tests your processor performance by calculating square roots with a recursive call of Newton’s method for estimating functions. It is influenced by memory timings and frequency. Intel XTU is a utility mainly used to overclock the processor and memory to benchmark the system for its stability and performance. The score obtained is a projection of the computer's true potential signifying its performance in real-life tasks. Coming in at $81 the Adata XPG Dazzle 16GB 2400Mhz Memory kit is one of the best kits in the price rage today, yes I said that straight! Not only does the kit lights up and glows in a fashion that it'll woo the modders and gamers alike but also the kits ease in physical installation and plug and play 2400Mhz XMP 2.0 profile makes it a delight for the common PC user. Overclocking wise not only we saw a huge 600Mhz bump over the rated frequency but it also matched with its very own 3000Mhz retail variant adding tremendous value to the 2400Mhz version of the XPG Dazzle. 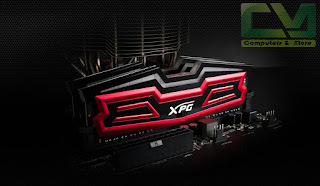 My only request to Adata is to launch more variants of the XPG Dazzle in other color combination like white-black, yellow-black etc to cater to more and more users. We highly recommend the Adata XPG Dazzle 16GB 2400Mhz memory kit to anyone out there who wants a perfect balance of performance, distinctive looks and overclocking in a single kit without burning a crater in the pocket! I give it a 8/10 and earns our Gold award.